× Two-Per-Day Tablets has successfully been added to the list . Every health regimen begins with a comprehensive multivitamin … but most of them don’t match the potency of Life Extension’s formula. Recommended Daily Allowances (RDAs) only provide minimal doses to protect you from deficiency. If you're not getting the ideal dose of vitamins and minerals, you won’t get the full benefits for optimal health and well-being. Our Two-Per-Day multivitamin has the highest nutritional potencies of any science-based multivitamin formula that can fit inside two capsules or tablets. Make sure you continue to get the most out of your daily multivitamin regimen with our Two-Per-Day Tablets. You will be Adding Two-Per-Day Tablets to the list . Everyone should be taking a daily multivitamin: there’s no simpler way to ensure your body is getting the essential vitamins, minerals, and nutrients you need to stay healthy and live better. 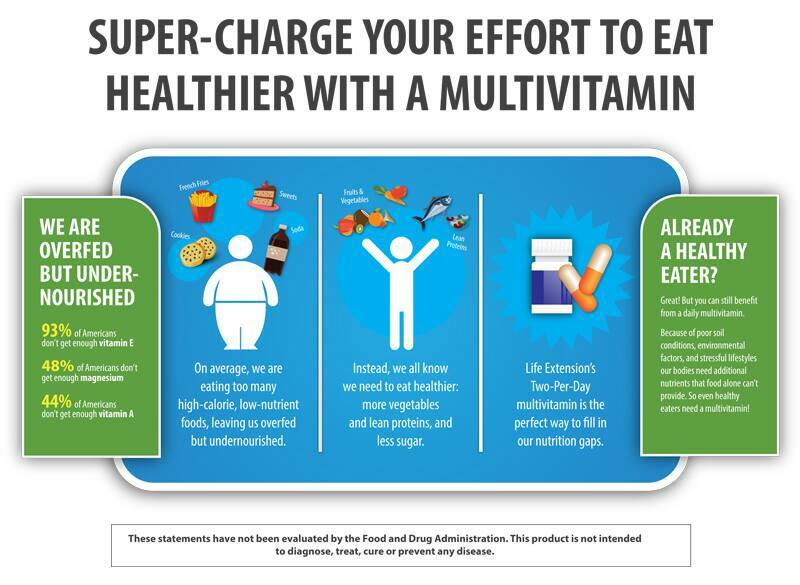 But not all multivitamins are created equal — so choose Life Extension Two-Per-Day Tablets. Other ingredients: microcrystalline cellulose, stearic acid, croscarmellose sodium, starch, maltodextrin, dicalcium phosphate, vegetable stearate, silica, aqueous film coating (purified water, hydroxypropyl methylcellulose, glycerin). SelenoExcell ® is a registered trademark of Cypress Systems Inc.
L-OptiZinc® and logo are trademarks of Lonza or its affiliates.